To help you to get started on hugging more people around you, here’s some inspiration from the Free Hugs Campaign. Side Note: If you go at this in full power, do hug strangers. But do ask for their permission before smothering them – and it is at your own risk! Do you think you give enough hugs in a day? If not, who else could you be hugging? Comment below with your ideas – I’d love to hear from you! Please do share this with your friends, family & social networks – you can play a part in spreading the happiness! Like it, tweet it, pin it, share it – you can create a happiness ripple effect! Remember to sign-up to my free weekly newsletter on the top left to be the first to know about new happiness tips & keep that happiness ripple effect growing! Good luck in your adventures & until next week! Nice post. Reminds me of a talk I saw earlier in the year from a Hotelier in Copenhagen, who’s hotel staff embraced new arrivals with a hug to make them feel welcome. Hi Laurence – What a great idea! Maybe that’s how service industries should be run? Thanks for sharing the video – great stuff! Wow! That’s great! I bet the people are really appreciative of this and feel like they can trust the staff more. Other places should start doing this. Hugging and laughter are extremely effective at healing sickness, disease, loneliness, depression, anxiety and stress, but healthy and wholesome habits of hugging and laughter are endangered by the bustle of modern life. The more typical ways of greeting people like handshakes are designed to keep us apart rather than bring us together. Hugging is very similar to meditation and laughter, teaches to let go and be present in the moment. Hugging encourages to flow with the energy of life. Hugging helps to get out of circular thinking patterns and connect with the heart, feelings and the breath. Reaching out and hugging releases Endorphins and serotonin into the blood vessels and the released Endorphins and serotonin cause pleasure and negate pain and sadness, lower blood pressure, decrease the chances of getting heart problems, helps fight excess weight and prolongs life. Even the cuddling of pets has a soothing effect that reduces the stress levels. But teddy bears, whose use has been increasing in the recent decades, are a poor substitute for the real hugging. The nurturing touch of hugging will make us healthier, younger, thinner, more relaxed, live longer, fight depression and make us age slower. A proper deep hug, where the hearts are pressing together not only improves both psychological and physical development, but also helps to build a good immune system, decrease the risk of heart disease, and decrease levels of the stress hormone cortisol in women. Hugging instantly boost the pair bonding hormone neurotransmitter oxytocin levels which stimulates and sharpens the senses, contributes to our sense of connectedness, causes to feel calm and happier; and heal loneliness, isolation, and anger. During lactation huge amounts of oxytocin are released from the brain to the breast tissue allowing milk to flow. Breastfeeding mothers have lower blood pressure. Oxytocin receptors have in other tissues, including the heart, kidney, thymus, and pancreas. Oxytocin plays a powerful role in protecting heart. By touching another person, oxytocin is produced in heart and travels throughout blood stream dilating them through a mechanism of increased nitric oxide leading to a decrease in blood pressure, less inflammation and less plaque build-up. Excess chronic inflammation is the key player in plaque buildup in arteries, known as atherosclerosis. Oxytocin reduces free radical formation and other inflammatory markers decreasing the risk for heart attack. Hugging strengthen the immune system. Love is a miracle drug. Hugging teaches us how to give and receive. There is equal value in receiving and being receptive to warmth, as to giving and sharing. Hugging educates how love flows both ways. The gentle pressure on the sternum and the emotional charge this creates activates the Solar Plexus Chakra. This stimulates the thymus gland, which regulates and balances the body’s production of white blood cells, which keep you healthy and disease free. Hugging for an extended time lifts one’s serotonin levels, elevating mood and creating happiness. A couple who hugs for 20 seconds has higher levels of oxytocin, and that those who were in a loving relationship exhibited a highest increase. 15 minutes of holding hands with a romantic partner can help reduce stress, and its harmful physical effects. Adults who have no contact with people had higher blood pressure and heart rate. Hugging therapy is definitely a powerful way of healing. The energy exchange between the two people hugging is an investment in the relationship. 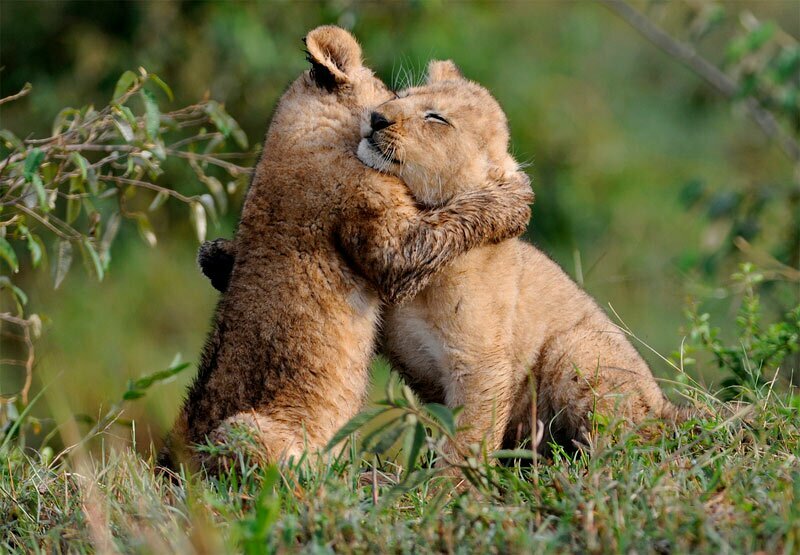 Hugging encourages empathy and understanding. Hugging is synergistic, which means the whole is more than the sum of its parts. This synergy results in win-win outcomes. Hugging also builds trust and a sense of safety, helps with open and honest communication and boosts self-esteem. In the mother’s womb, each part of the fetus’ body is touched by the amniotic fluid, which is the origin of the yearning for touch. Holding a baby offers physiological and emotional benefits. The tactile sense is very important in infants. During our early childhood our family’s touch showed us that we’re loved and special. The associations of self-worth and tactile sensations from our early childhood are still imbedded in our nervous system as adults. The cuddles we received from our parents, grandparents and relatives while growing up remain imprinted at a cellular level, and hugs remind us at a somatic level of that and connects us to our ability to self love. Hug relaxes muscles; releases tension in the body, take away pain and soothe aches by increasing circulation into the soft tissues. Hugging helps to stretch the facial muscles, erase age lines and slow the aging process. Hugs balances out the nervous system. The galvanic skin response of someone receiving and giving a hug shows a change in skin conductance. The effect in moisture and electricity in the skin suggests a more balanced state in the nervous system – parasympathetic. Hi Nalliah – Wow to the knowledge you hold! Hi Nalliah, I would love to repost your comment on my web page, may I have permission please? Me and my friend just spent about 4 hours (after going on rides) hugging people at six flags just for the fun of it and ended up hugging 205 people in toll. When they asked why we told them to spead the love and to give a stranger a Christmas gift. We did get some people who were not happy people and didn’t hug us but over all I feel the best I’ve felt for a very long time. Wow sounds like an amazing day out! What a great initiative and totally love the “spread the love” message, especially on Christmas – our world can always have more of that :) Wish I’d been there to support you – and so happy to hear you’re also feeling great after it! Merry Christmas & have a fabulous 2014! If it is difficult to hug humans… al-right. One can be with trees, animals, anything that you are and can be affectionate with….. Hug. Though it is mutual primarily it is the emotive initiative by one that matters…. and that to unconditional. Hi Prakash – I totally agree! There is a whole science about hugging animals and how they boost your happiness. Connecting with nature is also in there as something that boosts your wellbeing. I like the concept of ‘unconditional hugging’ – sometimes it’s the people who are most resistant to hugging that need it the most! Thanks for your kind comments Jaime and so glad to hear you’re hugging everyone around you to spread that goodness! I understand your concern (and there definitely is an element of foreplay in ‘romantic hugging’ e.g. cuddling) but in the end it’s about learning to be comfortable with friendly human contact. We all thrive in each others’ company and hugging is simply an extra booster to improve those relationships as well as get a happiness boost. It doesn’t mean that every time you say hi or bye you give them a 20-second hug – maybe you can leave the long, uplifting hugs for special moments or when you feel like your friends or family need them the most. I’m definitely lacking in hugs. I go weeks without hugs. I live alone. My family is not into the hugging affectionate thing. It’s my birthday today and I have not been hugged all day. Even when I try to hug persons it feels strange, but I try. I have a lot of pain in my body all the time. I believe if I get more hugs and caresses it would definitely help. None of us as children were breastfed as babies and this kinda counts for the lack of affection. I’ll hug myself in the meantime and considering getting a puppy. Hi Dixie – I’m sending you a big (virtual) HUG right now! Some families are more comfortable with physical affection than others and that’s ok. If you feel like you crave it and want to get comfortable with it, definitely hug as much as you can – your friends, your partner and even your family members if they’re open to it. You’re also spot on with the idea of dogs. They have a magical energy and they give unconditional love to pretty much everyone which makes them immediate happiness boosters, especially because of you being able to touch them and cuddle with them. I don’t always be the opportunity to hug my friends everyday but I hug my horse, Sassy, as often as I can – several times in a couple hour period. I never feel so supported or loved as when I can wrap my arms around her neck and bury my face in her mane. I’m so on board with you Dar! Hi there , love the article and the comments on hugs, I’m facing the worst trauma at this moment in my life, thanks to someone who claimed to “love” me. I’m so broken and destroyed. I have no one to hug me or comfort me..everyone around is harsh and probably hold the “u deserved it” attitude. Even my mom no support from her because thanks to my ex he humiliated me with her…. I’m so broken. I want to die. I’ve always loved animals and stuffed ones…I always find comfort and love with it…..I have a cat and love it and it loves me, it’s all I have for now. I’m sorry to hear about your trauma but I’m glad to hear you’re spending some quality cuddle time with your cat that you having a loving relationship with. Definitely keep this up and keep your eyes forward on the future. Sooner than you know you will be back to your normal self! Sending you lots of love, light & happiness! Hi Isabella, hugs would definitely be of benefit.. Here’s a thought: The subconscious mind doesn’t know the difference between reality and imagination – so I wonder if imagining someone hugging you would release oxytocin. You have more than just a cat – people have funny ways of hiding their love and support and affection and find it very difficult to express at times. Believe in yourself, and just keep asking for support and your cat, along with possibly using a stuffed animal and the visualisation suggestion I mentioned, should give you enough support to get you through this difficult time – every thundercloud has a single lining and every misfortune is a blessing in disguise. Big virtual hug coming your way!! Yes definitely ask for permission first! If you don’t you’ll replace all the positive effect of hugging with stress as the stranger might get worried about the random, unexpected show of affection. Wow! This is so accurate! I recently got out of an “I don’t need anybody, I’ll just live alone” phase after a breakup, and I crawled out of it begging for affection. I really did feel sick. Now I’m in a really affectionate band, and I’m happier than I ever was! Thank you for the read! So glad to hear you’ve joined the affectionate band – it really does make a big difference! I am very impressed with how much hugging affects people! I loved your article/s. So true, right?! It’s magical! Hi Nick – yes it’s true animals and even stuffed animals can have similar effects to having a hug so good on you for carrying a fox around! I am from the south of Europe and we love touching, hugging, kissing! After some years in a different profession I started being a carer for seniors in a country where touching or hugging is something not very well accepted. I tried to slowly do it. When you are lonely and sad I know how you feel with a good hug and I am happy to see how happy these people feel after getting used to it! I will keep on hugging! I love hugs!! The best place to get them from lots of people, believe it or not, is at a music festival. I love the music, as it’s the sweetest and most beautiful kind of music ever to exist. And I also love how fans and musicians are some of the sweetest and most affectionate people I’ve ever come into contact with. I try to attend as many festivals as my schedule and travel budget will allow, especially the ones with my favorite bands performing. I love hugs too Jeff! Festivals is indeed a great place to share them, especially because music really seems to bring the best out of people! Hugging showers unconditional love with your dear ones. Brain emits oxytocin which releases your stress and anxiety. I teach this to every one whom I meet on special occasions and my friends. Thanks for the wonderful video creation. I’m so glad to hear hugging helps you. A lot of people just need a hug to revive their mood back to a fresh one. I know, a hug has been so “out-fashioned” by some people these days! Why hug, when you can directly just kiss a person? Well, to be honest, you lose on some of the best feelings if you don’t hug off and on. I totally agree that a hug can totally set your mood into a positive one. It can provide comfort if your feeling low, it can calm you down if you’re feeling anxious, and it can help you feel loved if you’re feeling lonely. I think this hugging movement needs a lot of momentum. It’s just ridiculous in life these days! People send obligatory offers of ‘support’ to each other on email, yet never bother to follow up. It’s not genuine, or is not perceived as genuine, more often than not. A hug is the best way of proving to someone that you actually care, and aren’t just giving a ‘fake hug’ to just be polite. What is the best way, I wonder, to “warm” someone up to hugging – once you establish a hugging relationship with a person, they will nearly always open up and feel safer and comfortable – the only trouble is SETTING UP such a relationship!! But no wonder humans feel so lonely so much these days – because we never talk and there’s no physical contact. There needs to be connection between people in the physical/mental/spiritual/emotional/energetic sense and a hug encompasses all five aspects of connection at once – I wonder what the biological history of hugging is – how did humans start doing it, and why do animals do it to each other (such as apes)?! Lots of curiosity, and a lot of appreciation for hugs. P.s. Look up “http://bebrainfit.com/dopamine-deficiency/” – this is remarkable, the benefit of dopamine, then there’s oxytocin and serotonin – all released by hugging in high amounts. No wonder single people have more health problems than couples and couples tend to live longer than singles. No wonder email and text messages and phone calls don’t connect us – we still have the deeply ingrained need for physical and emotional expression, release, and validation. Nothing can replace a hug, nothing can so well give the myriad benefits of the hug and it’s effects (dopamine/serotonin/oxytocin) – it’s important to have some one to cuddle up to. Animals and stuffed toys work, but not as well as real people. So everyone, hugging is the most amazing phenomenon and the powers of hugging need more publicity. P.p.s. I have been studying at a private college for nearly 2 years now, and have noticed ALL BUT THREE of the symptoms I’ve ever learned of oxytocin, serotonin, and especially dopamine deficiencies which HAVE ALL GOT WORSE AS THE TWO YEARS PROGRESSED, and I put it down DIRECTLY TO A LACK OF PHYSICAL CONTACT (HUGS)!! I have only 5 people in my class, and all the people around somehow seem to leave me out (you can believe that I make up for it in every other possible way!) and hug each other without realising I’m there hanging for affection too! So when I’ve realised all I have about hugs and neurotransmitters which are released during hugs these last couple of weeks, I finally understand why my grades are decreasing despite my mental functioning and efficiency has skyrocketed!! I just can’t seem to concentrate BECAUSE OF A LACK OF HUGS! Any ideas what I can try to find more..
Brilliantly said Campbell – we definitely need more hugging in the world because it really helps people to connect better, feel loved and feel like they belong. I totally agree the hugs with people are the most powerful yet animals can also give a lot of positivity too if there isn’t a human in sight in that moment. For instance, there is so much research about how dog owners are happier, healthier & fitter because of the love, companionship and cuddles they get from their dogs. Definitely introduce hugs into all your friend and family circles if they are not there yet, and they will soon warm up to them and start to appreciate them too. With people you know who aren’t that close you can introduce it gradually, for example evolving from an awkward wave or handshake to a handshake combined with a half hug (by touching the other person’s shoulder with your free hand). When sleep, I lay on my left side and hug myself. I’m trying to find out if there is a reason why I do this. I give lots of hugs to people every day so it’s not from a lack of hugging. Hi Betty – this is probably a position that makes you feel cozy and comfortable! I give my grandma hugs and kisses to show her affection. Sounds lovely! I bet she enjoys them just as much as you do! Hi Mike I’m sorry to hear you’ve been feeling lonely without hugs. It sounds like your family is offering hugs so if for whateve reason they forgot to give one to you perhaps they didn’t even know you wanted one. Take the initiative yourself and go give them a hug! Or if you want to start small, try hugging a dog, a cat or even a stuffed animal. Sometimes when we’re out of practice from giving and receiving hugs we can get nervous about them. Even just saying it out loud can help make it sound less daunting: “I’m going to give ______ (fill in the black with whoever you want) a hug” – and then go and do it! You can also search for hug cafes or hug movements near you – or even suggest to your friends it might be nice to hug more. You are a brave, beautiful soul & I trust you can take the initiative to introduce hugs into your life! How long can anyone last in a very tight hug, known as a “Bear Hug”…? However little or long one likes! It depends a lot on personal preference, and on the relationship you have with the person you are giving a bear hug to. & a smile, if only in a mirror! My hugs are shared with 24/7 caregivers, friends in church & those who visit! Obviously, they’re NOT 20 seconds but are from the heart! Love the idea of 7 hugs, a heart laugh and a smile a day – what a great article! I have this whole new vision for people who are suffering from complex PTSD and addictions. I want HOPE, HEALTH, HEALING and RECOVERY for myself and others who are suffering who want/need to re-write their stories, re-wire their brains and re-frame their lives! I want to create PEACE in our communities and families in this country and my new mantra recently has been “HUGS not DRUGS”. I’ve just learned SO MUCH about how powerful HUGGING IS. WOW Thank you for sharing something so important and VITAL to my recovery and for my vision of LOVE for the future! I love your positive vision and your ambition for making it happen :) Sending many love filled hugs your way! Best to hug your pets instead of a bunch of ppl.